The first time Josephine noticed was one of the worst. She was sweeping out a vacated storage unit, music blaring through headphones, the building bright and empty. The door was shut. Her heart stuttered, then sped up. 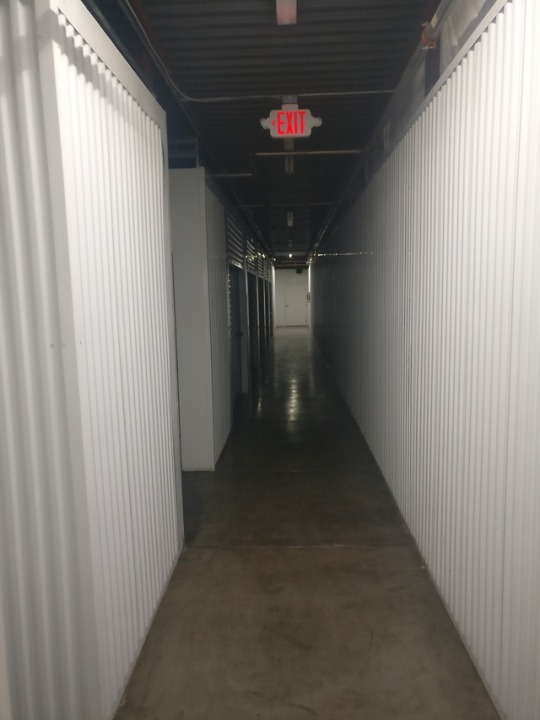 The darkness was only interrupted by thin gray light through the cracks between the door's top and the wall, from an emergency light far down the hall. She dropped the broom and gripped the dusty metal and pulled up, aborted by a sharp jolt on one side of the door; a lock. She backed up a step, ran into the pliable fabric of a box. Her eyes had adjusted to the bare light. The unit had been empty; now it was full, a ten-by-ten with someone's extra belongings; boxes towering over her, the swamp-cooled air thick and layered with dust. She beat on the door, kicked, screamed; panic overwhelming, choking. There was no one there. Late, she remembered her phone, called for help. There was a silence on the other end as her manager worked through the statement. “I don’t know,” tears formed, her voice small, swallowed by the closed space. When her manager cut the lock and slid the door open, she was sitting on a plastic tote full of books, calm except for the dust and sweat. The conversation that followed was almost as strange as turning to find the door shut. "This guy hasn't vacated yet. What were you doing in there? How did you get in with the lock on the door?" Her manager, baffled, was not paid enough to solve mysteries. Nothing was missing from the unit, the only thing lost was a lock. He told her to take a break and finish her sweeping. She did, jumping at every noise. Later that night, Josephine lay in bed. She'd showered, but she could still feel dust under her skin and sweat on her neck. When she blew her nose what came out was gray. She could not line the events up in a way that made sense, could not find an explanation, so she tried to forget what happened. She went to work the next day, swept the building, spoke to customers, laughed at their jokes, ate a cheeseburger with her manager, went home, slept, and kept the incident locked in its own storage unit in her mind. Three days later, it happened again. It was considerably more banal. Every day for two years Josephine had caught the bus near her apartment at 6:50 am, ridden it direct to a stop two minutes walk from work to start at 8 am. It was lucky, she always said, she didn't have to change buses or walk too far or get up too early. Today, there was no bus at 6:50 am. She checked her phone for route number 222. There was no route 222. She called the transit authority. There had never been a route 222, explained a tired older woman. There had never been a single shot along the route she described. Thanking the woman, she hung up and sat on the bench, staring out at the traffic. The heat from the morning sun was already seeping back out from the asphalt, the air shimmering. She called in sick to work, she went home and cried. Five days without incident, then Josephine’s key didn't work at her apartment. The complex had no record of her living there and the building manager threatened to call the cops. She sat out on the curb and called her mother, fighting the tears and panic away. "Hey, mom, I...I forgot my address. Can you remind me?" "Yeah, just a brain fart. I have to fill something out for work and I can never remember how to spell the street name." "You live with me, remember? On Paradise?" Yes, she remembered. Her mother had lived there for years. "Right. Um. Can you come pick me up?" Her mother's car was the same, a trashed white Honda that smelled like gasoline when driven too much. "Are you alright?" her mother's eyes were bleary, like she'd just woken up. "Yes. I think I'm just tired." "Your hair is shorter than it was last night." Josephine shrugged. Last night she’d had her own apartment. At the apartment she shared with her mother, she looked at all the things that occupied her bedroom. Some of them were familiar; a laptop, a teddy bear, t-shirts. She went to sleep, after crying. The next day her mother was dead, and had been for six months. The day after that, she no longer worked at her storage job. She came back from lunch and there was a strange woman working the front desk; Josephine had quit when her mother had died. 1) sometimes when I move, or sleep, or blink, something in the world is different. 2) The only things that stay the same, no matter what, is me, my body, and the stuff I'm wearing. She piled some things - clothes, laptop, toothbrush, a pocketknife her mother had given her - into a backpack and sat and watched a black and white western. She went into the kitchen to make a sandwich. When she returned, a strange man slept on the sofa. On tv, the western still blared; gunshots, horses kicking up dust. It reminded her of the storage unit. Her backpack sat where she'd left it on the floor. She went to grab it. The man stirred, woke, looked at her tiredly. She snatched the bag and backed away. "Hey," he said, "Did you switch again?" "Yeah, you did," He stretched, thin and pale under a white shirt and sweatpants, "I'm Jayden. I’m your boyfriend. In this reality." Twenty minutes later, she had a larger idea of her situation. "I've seen eleven of you so far. Some of you know me, some of you don't," he ate half her sandwich and she sat on the couch arm, clutching her backpack, "something about different realities that are mostly the same but slightly different, and you, or the different yous, keep switching with each other." "This has happened eleven times?" she only could remember six. "Yeah. That I've noticed. I kind of have to go by how you react to me. The first couple of times the you had broken up with me - or her me - a while back. The last two yous haven't known me at all. Like you." The pronouns spun in her head with thoughts of parallel realities. She tentatively slid down onto the sofa. "I gotta go to work soon. Maybe I'll see you when I get back? Won't have to explain this all again for a couple days?" She fell asleep on the lumpy sofa before he left, but the tv still blared when she woke up, groggy in a dim twilight, an old black and white show that was too old to make any sense to her, and she fell back to sleep, clutching her backpack, thinking that her mother would’ve understood the stupid tv show, might’ve been able to explain the dead slang and metaphors. When she opened her eyes again, she was in a bed, in an unfamiliar bedroom. Rain drummed on the roof, the low steady sound that indicated it might last all night. Next to her, Jayden slept, his bare chest seemed like old milk, pale in the minimal light from the moon outside. The smell of him was everywhere, a cheap, sweet cologne and sweat. He stirred as she did, then gripped her wrist, her muscles tensed, “Let go,” she said, too loud for the deep stillness under the rain. His stench settled in the back of her throat with a familiar fear, she slid out of the bed, feeling the skin of her back catch on the cheap metal bed frame. Jayden was rising now, coming to follow her, his fingers around her wrist until they weren’t. His fingers were gone, his smell had receded, and she sat on the floor of the room and felt the scratches bleed into her shirt, listened to the peaceful sleeping noises from that strange man who might still have once killed her. She found the knife in her backpack easily, silently, and it slid into his neck with barely any effort, his blue jugular visible even in the dark. Maybe he was a different person than the one whose fingers would leave bruises on her wrist, but he hardly made any noise as he died, as blood flowed out to darken the sheets, just like the little spots that’d be on the inside of her shirt. If another Josephine followed, she would be safe. She slid out of the room and the apartment; the door creaking on its hinges so much she left it open. The alien complex shone slick and silent in the dark under the pattering of the rain, her heart beat rocking her chest so hard she could feel it in her eyes. The gate to the apartment complex faced an empty desert and clear stars while the city behind turned the sky above it pink. The street was a long island of weak yellow light between the two halves of the world. There was a bus stop down the block, where an old man, tiny and stooped, waited under the paltry shelter. He clutched a white plastic grocery bag like Josephine clutched the straps of her backpack. "If you want the 1:30 to Paradise you missed it," he said, with a strong accent. Then, peering at her, "estas bien?" "No," she said. She looked down at the concrete sidewalk as it darkened with rain one spot at a time. She blinked, looked up. The bus stop was empty. Josephine was gone. Everything else remained where it was supposed to be. She turned, and walked through the rain across the street, away from the lights of the city.